The global tissue paper packaging machines market was valued at US$ 194.4 Mn in 2016 and is expected to be valued at US$ 321.8 Mn in 2027. The global tissue paper packaging machines market consists of packaging lines as well as standalone units which prominently include components such as wrappers, bundlers, case packers, etc. particularly designed for roll and folded products. The market is influenced by factors such as demand for tissue paper products in consumer and away from home (AFH) market, cost of manufacturing of tissue paper jumbo rolls, and the advancement in the technology. Tissue paper packaging machine manufacturers across the globe has experienced the rise in demand of tissue paper products among consumers and thus expanding the production capacity of the machinery. The global tissue paper packaging machines market is expected to expand at a CAGR of 4.7% in terms of market value over the forecast period 2017-2027. The global market is observed to generate revenues primarily driven by tissue paper industry. Key market characteristics observed in the global market for tissue paper packaging machines include high demand for private label brands and various expansion activities made by key players of tissue paper packaging firms increasing the demand of high capacity tissue paper packaging lines. The market volume for global tissue paper packaging machines is expected to expand 1.6X during the forecast period 2017-2027. Transparency Market Research, in its report titled, “Tissue Paper Packaging Machines: Global Industry Analysis, Size, Share, Growth, Trends and Forecast, 2017-2027,” has segmented the global tissue paper packaging machines market system type, by operation and by geographic regions. On the basis of system type, the global tissue paper packaging machines market is segmented into toilet roll packaging lines, kitchen roll packaging lines, folded tissue packaging lines and standalone systems. Toilet roll, kitchen roll and folded tissues packaging lines are further segmented into consumer market and away-from-home (AFH) market. The toilet rolls packaging lines is the leading segment with market share of around half of the global market. Folded tissues packaging lines is the fastest growing segment due to a high scope of innovative packaging and rapidly increasing consumer preference for folded tissues. Within toilet rolls packaging lines segment, the AFH market contributes with only around one-fourth of the market segment. This has created ample opportunity in the AFH market to expand globally for toilet rolls packaging lines market. A tissue paper packaging line basically consists of palletizer and a product specific primary packaging machine such as bundler, wrapper or box tissue packaging machines. Thus, the regional tissue paper products manufacturers with low investment capability prefer a single unit of the primary packaging machine over the completely integrated line and perform rest of the operations manually. This has resulted into considerably high market share of standalone systems in global tissue paper packaging machines. On the basis of operation, the tissue paper packaging machines market is segmented into automatic systems and semi-automatic systems. The semi-automatic machines are generally preferred by the low volume output tissue packaging firms. Since the key players of tissue paper products market has hardened the survival for the emerging regional players, the demand of semi-automatic tissue paper packaging machines is restricted. Moreover, the advancement in technology has reduced the cost of automatic machines, driving the market for automatic tissue paper packaging machines market. The global tissue paper packaging machines market is segmented geographically into 7 key regions including North America, South America, Europe, Middles East and Africa (MEA) and Asia Pacific excluding China & Japan (APECJ), China and Japan. TMR estimated Europe to hold nearly one-third of the global tissue paper packaging machines market by 2017. Through the course of the forecast period, only minor fluctuations are likely in the market share held by the region. North America held the largest share in the global tissue paper packaging machines market in 2016. It is also likely to hold a high share in the kitchen roll packaging lines segment. Besides this, the market will witness lucrative prospects in China. The average selling price of machinery in China is very low and it exhibits a high penetration of low-capacity packaging machines. Therefore, the country provides an environment conducive to the market’s expansion. China is likely to enjoy a strong foothold in the global tissue paper packaging machines market. Some of the players operating in the global tissue paper packaging machines market include Fabio Perini S.p.A, Tissue Machinery Company S.p.A., BaoSuo Paper Machinery Manufacture Co., Ltd., STAX Technologies D.O.O., Shanghai Soontrue Machinery Equipment Co. Ltd., Dechangyu Paper Machinery Manufacture Co., Ltd., M.T.C. (Macchine Trasformazione Carta) S.R.L., Wangda Industrial Co., Limited, Infinity Machine & Engineering Corp., Unimax Group Engineering & Development Corporation, Valley Tissue Packaging, Inc., Preferred Packaging Italy S.R.L., Microline S.R.L., Maflex S.R.L., Imako Automatic Equipment Co., Ltd., Hinnli Co., Ltd., Heino Ilsemann GmbH, CPS Company S.R.L., Christian Senning Verpackungsmaschinen GmbH & Co. KG, and Amotek S.R.L. Transparency Market Research examines the global tissue paper packaging machines market for the forecast period 2017-2027. The primary objective of the report is to identify opportunities in the market and present updates as well as insights pertaining to various segments of the global tissue paper packaging machines market. 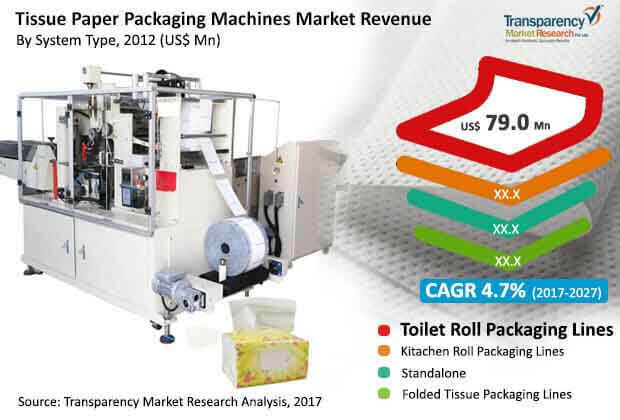 The report begins with an overview of the global tissue paper packaging machines market, evaluating market performance in terms of revenue, followed by TMR’s analysis of key trends, drivers, and restraints witnessed in the global market. Impact analysis of the key growth drivers and restraints based on the weighted average model is also included in the report. To compute the market size, in-depth secondary research is done. Data points such as regional splits and market split by system type has been assimilated to arrive at appropriate market estimates. The report comprises the forecast of the global revenue generated by the business in tissue paper packaging machines market. TMR triangulates the data via different analysis based on supply side, demand side as well as the dynamics of tissue paper packaging machines market. Vital feature of this report is the analysis of the tissue paper packaging machines market by region, system type and operation; and the corresponding revenue forecast in terms of incremental dollar opportunity. This is traditionally overlooked while forecasting the market. However, incremental dollar opportunity is critical in assessing the level of opportunity that a provider can look to achieve as well as to identify potential resources from sales perspective of the global tissue paper packaging machines market. To understand key segments in terms of their growth and performance in the tissue paper packaging machines market, Transparency Market Research has developed a market attractiveness index. The resulting index should help providers identify existing market opportunities in the global tissue paper packaging machines market. In the final section of the report, tissue paper packaging machines market competitive landscape is included to provide a dashboard view of companies that manufacture tissue paper packaging machines. The report contains company profiles of some of the players in the global Tissue Paper Packaging Machines market. Some of the players operating in the global tissue paper packaging machines market include Fabio Perini S.p.A, Tissue Machinery Company S.p.A., BaoSuo Paper Machinery Manufacture Co., Ltd., STAX Technologies D.O.O., Shanghai Soontrue Machinery Equipment Co. Ltd., Dechangyu Paper Machinery Manufacture Co., Ltd., M.T.C. (Macchine Trasformazione Carta) S.R.L., Wangda Industrial Co., Limited, Infinity Machine & Engineering Corp., Unimax Group Engineering & Development Corporation, Valley Tissue Packaging, Inc., Preferred Packaging Italy S.R.L., Microline S.R.L., Maflex S.R.L., Imako Automatic Equipment Co., Ltd., Hinnli Co., Ltd., Heino Ilsemann GmbH, CPS Company S.R.L., Christian Senning Verpackungsmaschinen GmbH & Co. KG and Amotek S.R.L.